From Googling, here is a specimen of Norway Maple. Googling...the tool of all Discovery Channel Botanists. They had better not be Norway maple. It's considered by many to be invasive. It's probably not a huge concern in the colder climates of the Adirondacks, but it has completely taken over some forested areas in the Hudson Valley and on Long Island. They could be maple but my money is still on ash. The example you provided to sugar maple is the exception rather than the rule for the species, I think. Do you have any uncropped versions of these photos you can share? I do not expect everything on Google Images to be correctly labeled. It's no better than the sites it draws on. A 'stock images' file is not likely to be very carefully considered when it is captioned, in my opinion. 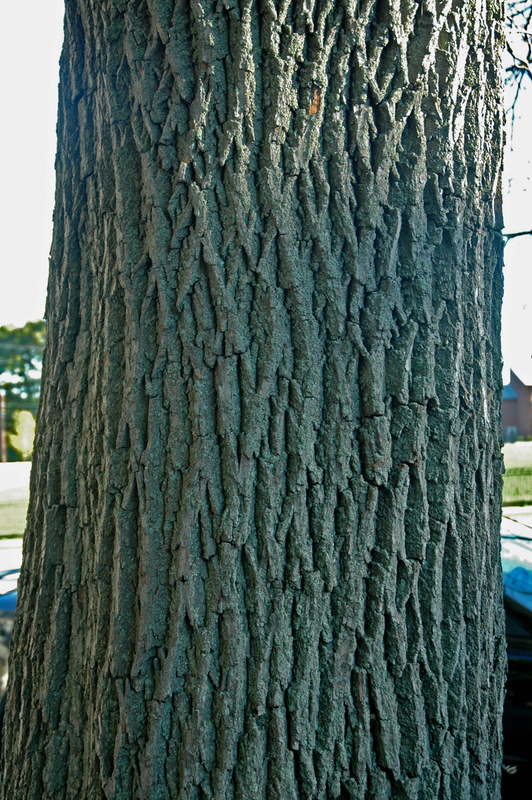 Red maple bark can be quite variable - I've seen BIG red maples get shaggy bark like the original photo #1. I'm good at tree identification, but without more details I wouldn't bet the ranch on having all these correctly IDed. I have a huge Norway Maple growing in front of my house. They and Silver Maples line the street. The pics I posted are the uncropped versions. I'm putting my money on Ash if you are. How much did you put? Btw, DSettahr, do Black Birch grow in the Adirondacks? I'm sure there's probably a black birch or two somewhere in the Adirondacks, but they definitely aren't common. The Adirondacks are a little bit too far north/too high in elevation for them. I wouldn't be super surprised to come across one in the Adirondacks but it would certainly also be noteworthy. 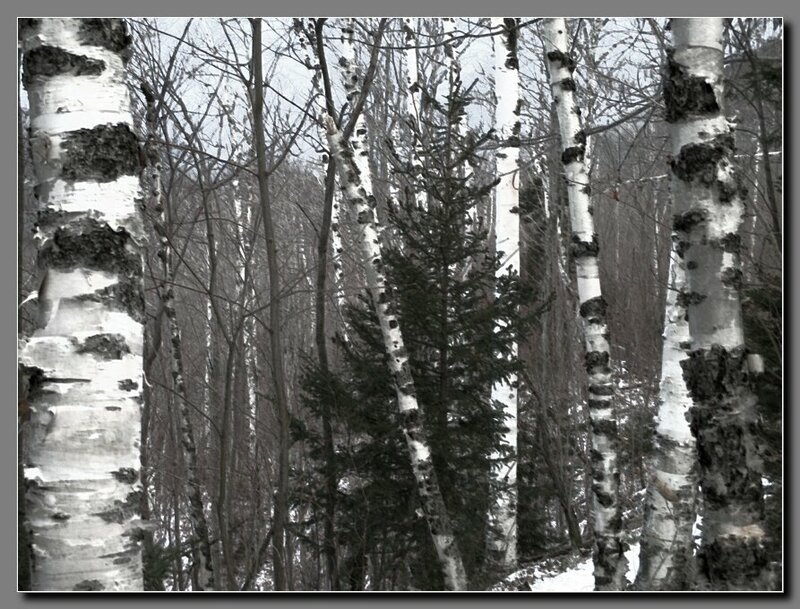 It's possible that one of birches is a gray birch, but that would be somewhat unusual also. I would want to see the leaves to be sure. Norway maple is a common street tree due to its high level of tolerance of adverse growing conditions (which probably also contribute to it being invasive). There is some evidence that the species is capable of allelopathy (using chemicals to suppress the growth of other competing species). Silver maples are also tolerant of wet conditions in particular and are commonly used as street trees as well, although the wood is known for being weak. It's a good idea not to plant any silver maples close to a building or a driveway if you don't want to end up having to pay for repairs to your house/car in the long run because a branch fell on either. Silver maples are also somewhat rare in the Adirondacks- they are a bottom land species and can be found growing alongside some of the rivers but that's about it. I know they grow extensively alongside the Raquette River downstream of Raquette River Falls. Gray birch, in my limited experience, also seems to be slightly less "peely" than paper birch (which does fit your image). Gray birch also doesn't get very large- it rarely exceeds 30 feet in height. But I'll be the first to admit that I don't have much experience with gray birch. I would want a good look at the leaves to be sure- they are are elongated and are very distinctive in comparison to paper birch leaves. An easy way to distinguish between paper and yellow birch is to break a branch and then smell it. Yellow birches have sap that smells like wintergreen. 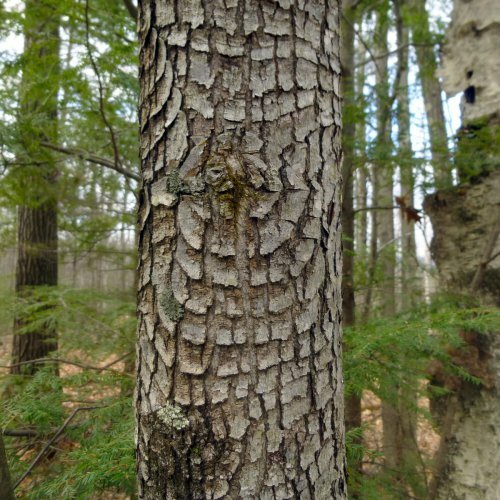 Black birches also have a sweet smell (they can be taped and the sap made into syrup, as with maples), but it's not easy to confuse a black birch with other types of birches that we have here in the northeast- they are very obviously darker in color. Young aspens have creamy white bark and to the untrained eye, they are often easily mistaken for birches (there are no aspens in the set of images, however). The "red pine" could also be scotch pine, an introduced species that was widely planted by the CCC that has become naturalized in many areas of the Adirondacks. The bark coloration would make more sense, I think- Red Pine does have reddish tint to the park in places, but scotch pine has a very obvious reddish-orange tint to younger portions of the tree. Those look like paper birch to me. This thread is really getting interesting and informative. When trying to identify an ash by its bark I have been taught to look for a chain-like or diamond pattern in the furrows. Interestinger and interestinger. I have always assumed this was a Grey. Maybe not? I'm heading out tomorrow for a hike. Will bring back some more pics but will take more than just the trunks. Like dundee, I'd say those are white birch. I've seen black birch in the southeast fringe of the park, so I assume that there are some within the blue line. 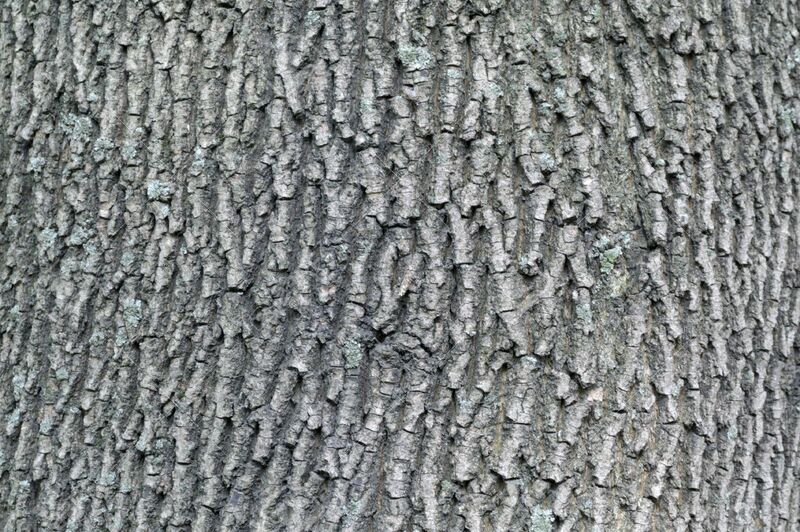 In Ketchledge's guide book, "Forests and Trees" he shows a picture and describes red maple bark as resembling an exaggerated Eastern Hophornbeam. That's why I figured #1 was a red maple. That doesn't really seem right to me. It might be true in some cases, but again, it's an exception rather than the rule. Apparently these patterns appear in response to a fungal infection and they are not ubiquitous to all red maples, but it is the single best clue I've found for identifying the species based on the bark alone. If you can get a good l look at the buds, red and sugar maples are pretty easy to tell apart. Red maples of rounded red buds, while sugar maples have pointy brown bugs (the same color as maple syrup). Both have opposite branching patterns. Ashes have opposite branching patterns also, but their twigs are much stouter (wider) than maple twigs are. To the trained eye, the difference between ash and maple twigs is readily apparent, even from a distance. 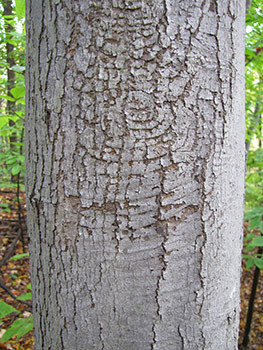 Again, according to Ketch, the bull's eye pattern is more often seen in younger trees while the exaggerated Hop Hornmean shaggy bark appearance shows up more often in older specimens. The picture in the book shows both the bull'e eye in one specimen and a very shaggy looking trunk in another, older one. I'll have to go back to the Rooster Comb trail and gather more clues!